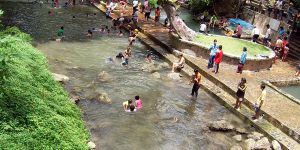 Hin Dat Hot Springs, also known as Kui Mang Hot Springs, is located at Hin Dat suburb, Thong Pha Phum district. It was accidentally found by Japanese soldiers during Death Railway construction, in 1943, World War II period. This is natural hot springs flowing flow the underground though out the entire year. At Hin Dat Hot springs, it was divided into 3 pools - hot pool, warm pool, and not so hot pool for kids. In fact, there is one more pool separated for monks only. Most visitors who come to enjoy these hot springs believe that minerals in natural hot springs will be able to make them healthier. Around hot springs area, a number of trees are available to provide natural atmosphere. There is also a canal providing normal water (not hot) in the area, so those who want to enjoy normal water can do it here. 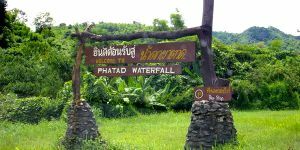 Visitors can take a bus to Thong Pha Phum or Sangklaburi from Kanchanaburi Bus Terminal. Don't forget to inform the driver for getting off at Hin Dat Springs. 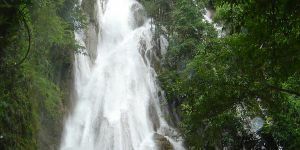 After that, walk about 300 meters from the main road to the springs. 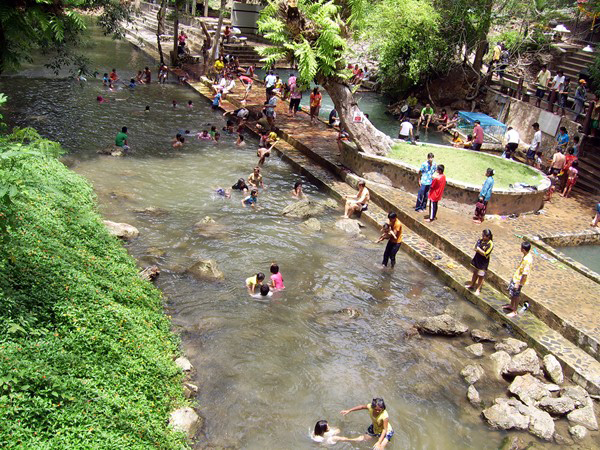 The springs open from 6 AM - 10 PM, and it was operated and managed by the Hin Dat Local Administration Office for tourism industry.